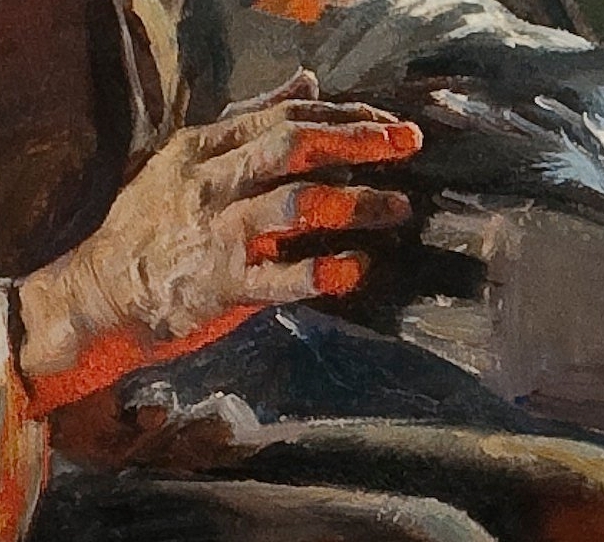 Joanna Bourne: Hands. Just because. I have a scene in the back of my mind that I really want to sit down and write. I will, as soon as I get some mental space. I'm about to introduce the character of Pax -- Camille and Pax -- to each other. I want Camille to notice Pax's hands. So I'm thinking about hands in general. You are about to reap some of that. Hands are sensual, damaging, and genius all at the same time. One hand or two can bring a myriad of emotions to life with any number of things that occur. 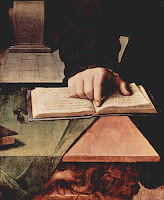 In a historical novel hands are so important, they betray a person's class or status in society and a bare hand is sure to entice someone to a little intimacy. Love the post... sure got my mind a tumbling. My folks are about to meet on the steps at Meeks Street; one coming away from the house; one going in. I don't know which POV I'm in . . . probably Pax. Whoever it is, I want him/her to sum up the other person quickly and file it all away. Should include hands. Problem with putting this in his POV is that I see his hands better than hers. But if I'm in her POV I have to add stupid backstory. Unless I just don't . . .
Love that image of one person signing into another person's hand. I'm in a dark cave at the moment. There's a hero, a heroine, and a narrow opening far far above that lets in a bit of starlight. And an owl with a nest up there. Heroine is frightened of bats, but there are no bats, the hero says. She believes him. Sounds like a great place for your characters to be. I mean, not so much for them. But for you. Owls are cool. And many of them are noisy, which is also cool. This is interesting, because I always notice a person's hands. 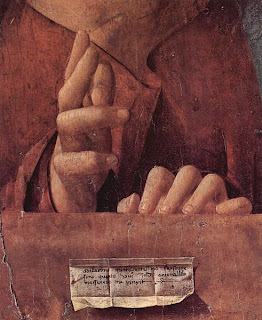 Many people gesticulate with their hands, so you can see certain things. In a novel, a person can see whether the hands are stong or delicate and whether the nails are groomed or chipped. Just a suggestion: I would check a book on Palmistry. It used to be that people were judged by the shape of their hands. "He has artistic hands." or creative hands. Long fingers meant that someone was creative. "Working Man's hands". Also calluses on unusual parts of the hands because of work or crafts or abilities. Violinists have calluses on their finger tips of one hand only. People who type (or keyboard) usually have short fingernails that don't interfere with their typing/keying. Scars on hands from accidents, injuries, or just working with their hands. 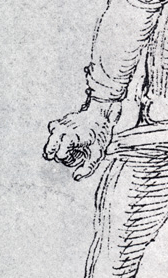 Blacksmiths & glassmakers have burns on hands & arms. Scars from childhood accidents. I knew a man who was scarred from his hand getting stuck in a wringer washer! Another man lost fingers in an industrial accident. Would a person who was jailed in that time get scarred or damaged from the police or jailers? Did they use a branding iron to identify thieves? Did people use pumice on their hands to keep them smooth at that time? And, even now, people are judged by the shape of their fingers.. which ones are longer & what that means throughout history. Also, what about those who were born with "extra" digits?? Joanna, I'm throwing too much out to you... but sometimes when I get going.... it is hard to stop! Good stuff, all of it. I see myself -- you have to understand this is Very Early in writing -- using references to hands between H&H in about five places in the story. I'm sort of storing up thoughts and words for when I get to writing those scenes, so everything is useful. I know Pax has long-fingered hands. He's kinda a long-drink-of-water type anyhow, so this makes sense. Hands are so important - whenever I think 'hands' it's drawings I see - da Vinci's, Durer's - they're so beautiful. Hands keep or reveal secrets, betray emotions, show strengths and weaknesses. So intriguing! Pax and Camille. Sigh. I love that you're blogging about them -- I feel like a kid who just finished unwrapping her Christmas presents and is already wondering what Santa will bring next year. Cheeky and ungrateful, I calls it. Artists love to draw hands for just that reason. They're so evocative. I think it was Erma Brombeck who said your hands should look as though they've been holding something else besides each other. You know that when a book hits the shelf, the writer is already deep into the next one. I should be further along than I am. I must settle down and do more work on Pax. I'm reminded of the scene in Titanic where Rose is looking at Jack's sketches and she accuses him of having a love affair with one of the models and he says "No, just her hands." Exactly!! People think of the eyes as the window to the soul. True. True. But the hands tell us so much. Maybe the hands are the backdoor to the soul. can't wait for story of Pax and of course for the book next week. I try to show the hands of the characters. Hands are defining. Pax does have the hands of a librarian -- though that's not his work. He does art, among other things.